Fatgirl Hedonist: No Slowing Down for Copperpots! No Slowing Down for Copperpots! 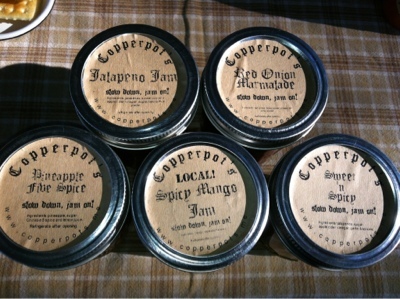 Copperpots is a locally owned startup company owned by a young couple, Vanessa Safie and Tom Wilfong. Copperpots has been in existence for less than a year, but in that short time they’ve gathered a cult following for their ingenious creations. You can find their concoctions at a couple of local establishments including Sweetness Bakeshop, Lokal Burgers & Beer and Pincho Factory. What are their creations, you wonder? Bueno, they’re in the jam business for now, making inventive jams like Pineapple Five spice, Red Onion Marmalade and Spicy Mango Jam from locally accessible fruits and veggies. However, they’ll be expanding all too soon. They’re starting to spread their wings and branch out into the savory world. For the last two weeks they’ve been selling their addictive homemade Sriracha hot sauce. I was lucky enough to catch these two for a quick interview to see what they’ve got up their sleeves and what they’re currently got cooking. To read the interview go HERE!